I always regarded the Viscount as a new aircraft; it certainly eclipsed the DC-3s where ever it replaced them in service around the world. My anguish can be imagined when I was recently reminded that 50 years had gone by since ZK-BRD whistled past my house prior to making its first New Zealand landing. 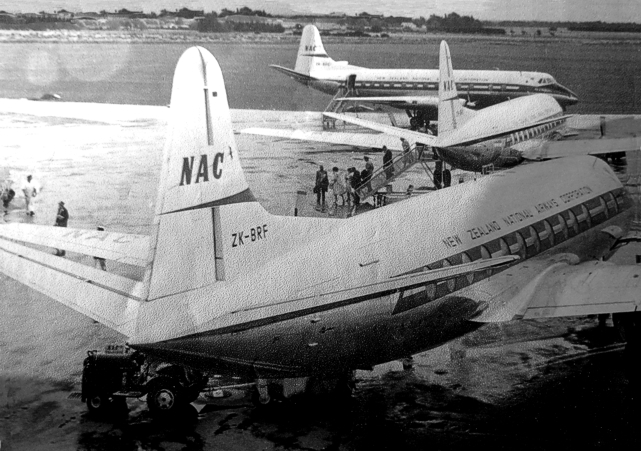 ZK-BRD was the first of a batch of three V.807 Viscounts purchased by NAC - New Zealand National Airways Corporation. In February 1950 the General Manager, F M Clarke, envisaged that NAC would enter the turbo-prop era in five or six years. In November 1952, Captain J J Busch (new general manager) went on a business trip to England where he inspected a Viscount and was favourably impressed. Soon after, in March 1953, Captains H C 'Johnny' Walker and Jack Register along with two engineers D C Smillie and A K Clarke visited BEA - British European Airways to observe and trial new technical aids. Highlight for Walker would have been the opportunity to fly a Viscount. The actual purpose of their visit was to take delivery of de Havilland Heron ZK-BBM. 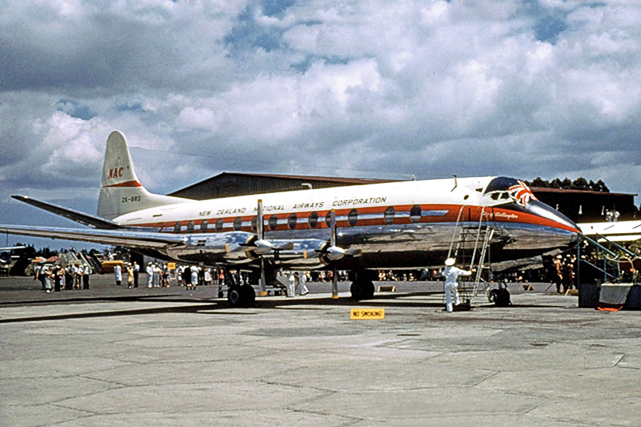 Seven months later, in October 1953, New Zealand had its first opportunity to see a Viscount with the arrival of the BEA - British European Airways Viscount c/n 3 G-AMAV on the completion of the London to Christchurch air-race. 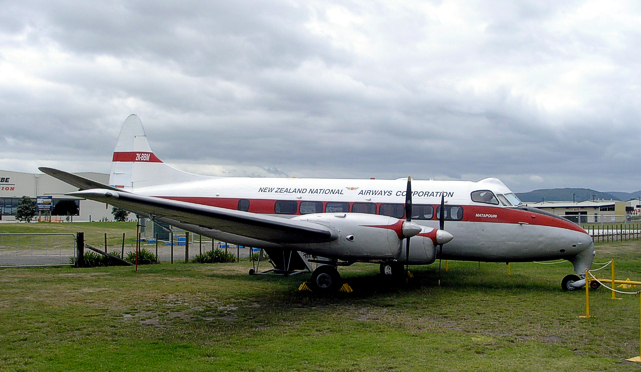 While in New Zealand it was demonstrated to NAC at Christchurch (Harewood), Auckland (Whenuapai), and Wellington (Paraparaumu) even though the last named airport never joined the Viscount network. Although favourably impressed, NAC did not order Viscounts at this stage. 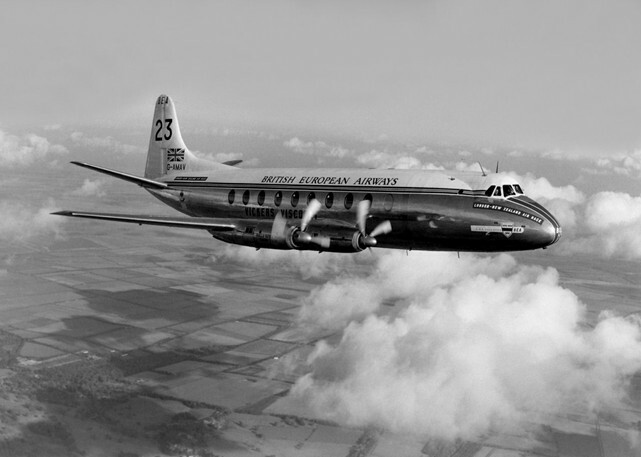 In June 1955 the NAC Board approached the government indicating it wanted to order three V.700 series Viscounts for delivery in 1957 and 1958. Approval was eventually given and in December 1955 the Chairman Sir Leonard Isitt and general manager Captain J J Busch signed an order in Vickers House, London. Representing Vickers-Armstrongs was Major-General C A L Dunphie. NAC was a State Owned Enterprise (SOE) controlled through a Board by the Government, in fact, it was New Zealand’s very first SOE. In February 1956 NAC amended its order from three V.700 series to three V.800 series Viscounts with its own model being the V.807. These aircraft were allocated the registrations ZK-BRA to ZK-BRC. On 31 July 1957 Wellington's city airport (Rongotai) was closed for reconstruction to emerge as Wellington International Airport. From that date, until July 1959, all NAC Wellington operations staged through Paraparaumu about 35 miles north of the city. NAC had used Rongotai purely for the Herons to operate services across Cook Strait to Nelson and Blenheim in the South Island and also to Napier, Rotorua and Hamilton in the North Island. When it became apparent that Wellington would not be available until July 1959, Viscount deliveries were put back until 1958 and 1959. In the meantime NAC had formed a 'Viscount flight' comprising senior Captains A C Kenning (Viscount Specialist Captain), J H Register (Senior Viscount Captain) and G Harvey (Viscount Training Captain). Their role was to identify and arrange for the training of sufficient Douglas DC-3 pilots to provide a seamless introduction of the Viscount. Early in 1957 these three Captains were trained on Viscounts by TAA - Trans Australia Airlines in Australia and then returned to New Zealand to ground train seven other pilots in the NAC Training School in Christchurch. On arrival of the first Viscount, all ten pilots underwent extensive training in the air. NAC decided that they were not keen on registrations ZK-BRA and ZK-BRC and over the phone arranged with the Civil Aviation Administration (CAA) for them to be changed. The revised letters allocated were ZK-BRB, ZK-BRE and ZK-BRF. In preparation for the arrival of the Viscount NAC had produced a considerable amount of literature for the travelling public. The CAA was surprised when looking at this material that the first Viscount was recorded throughout as ZK-BRD. Apparently the person from NAC misheard the CAA person over the phone! Unfortunataly ZK-BRD had already been issued to a Tiger Moth. Rather than upset NAC with all its attractive marketing material, CAA simply rang up the owners of the Tiger Moth and asked them to repaint it as ZK-BRB and that they would attend to the paper work. So the Viscounts officially became ZK-BRD, ZK-BRE and ZK-BRF. A milestone occurred on 11 December 1957 when Viscount ZK-BRD took off on its maiden flight as the first New Zealand registered turbine powered airliner. After an extensive flight test programme it was handed over to the delivery crew comprising Captains H C Walker, G Harvey and J H Register on 31 December 1957 (GMT) i.e. 1 January 1958 (NZT) and set off on its delivery flight to New Zealand. Support crew carried comprised engineers A T Mosley, H Clarkson and Arthur Godfrey Isles, together with aircraft inspector A Herk. The route followed was Rome (Italy), Athens (Greece), Beirut (Lebanon), Bahrein, Karachi (West Pakistan), Delhi (India), Calcutta (India), Bangkok (Thailand), Saigon (Vietnam), Zamboanga (Philippines), Biak (New Guinea), Darwin (Australia), Cloncurry (Australia), Sydney (Australia), Auckland (New Zealand) and Christchurch (New Zealand). According to Captain Walker, this was the first V.800 series Viscount to be seen east of Rome. On board was 2,000 pounds of spare parts. It must be remembered that this Viscount was going to be based further from the factory than any other example and it was to be another 16 years before it would return to England. ZK-BRD arrived in Sydney, Australia on 8 January and departed on 10 January at 05:00 AET (two hours behind New Zealand time) with an ETA in Auckland, New Zealand of 12:30 NZT. The Viscount made its land fall at 11:30 over the Kaipara Harbour, on the West Coast of the North Island, about 50 miles north of Auckland. From there it flew south and circled Auckland City twice before touching down at 12:00 at Whenuapai Airport. Auckland's weather that day was described as the best all that summer; I remember that it was superb. On landing, the Viscount rolled up to where an official party was ready to greet it. Proceedings started with a Maori group performing a song of welcome. Various speeches were made, including one by NAC Chairman Sir Leonard Isitt and a telegram was read out that had been received that morning by the Prime Minister, Walter Nash. It had originated from Sir George Edwards (the designer of the Viscount) expressing pride that his company had brought New Zealand into the turbine age. Sir Leonard's wife, Lady Isitt then poured a goblet of wine over the City of Wellington's nose stating the words 'Good luck to her and God Bless all who fly in her'. What is not well known is that a mere 40 miles south of Whenuapai another new era was unfolding. Former RNZAF Station Ardmore was each year used to hold the New Zealand Motor Racing Grand Prix. The Viscount arrived on a Friday and next day was Grand Prix Day. While ZK-BRD was being welcomed at Whenuapai, over at Ardmore Aerodrome (still in use in 2008) Jim Meikle, a British immigrant, was testing what was reported as the World's first jet powered racing car. According to the report, the engine was an adaptation of that used by the Germans to power their V1 rockets of World War Two. Another significance about 10 January 1958; it was exactly thirty years to the day since John Moncrieff and Captain George Hood perished in the Ryan Brougham G-AUNZ on the first aerial attempt of the Tasman Sea. Whereas these two men attempted to fly the Tasman in 1928 it took another 80 years before Australians James Castrission and Justin Jones became the first two-person kayak crew to cross the Tasman. They sighted land about 10 January 2008. 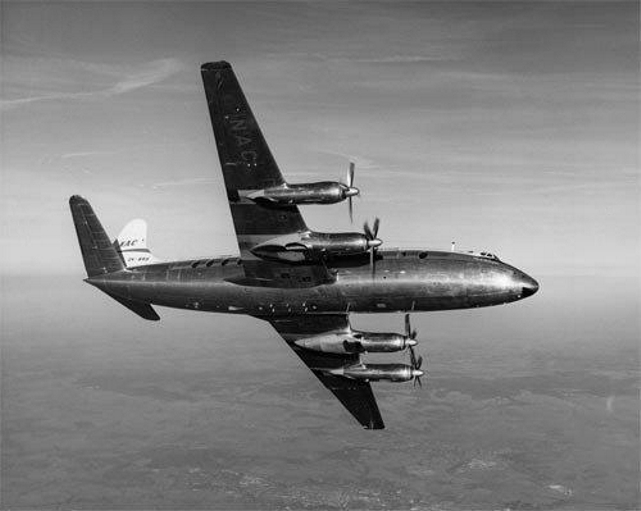 Also on 10 January 1958, NAC's first Heron, formerly ZK-AYV, now registered G-APJS, was in the early stages of its delivery flight back to England. Unfortunately the aircraft crashed on 19 February 1958 and remained missing until sighted on Mt Saraceno, Italy in May 1958. There were no survivors. Meanwhile back at Whenuapai the time came all too soon for the Viscount to carry on to Christchurch. At 14:40 the audience heard what was to become the familiar sound of the Rolls-Royce Darts as it climbed from the runway 'like a rocket' for the journey south. The advertised time for scheduled Viscount services between Whenuapai and Christchurch was 1 hour 55 minutes, however on this occasion the trip took 2 hours 30 minutes as ZK-BRD deviated over various locations including two circuits of its namesake Wellington, capital city of New Zealand. While it headed south a large welcoming crowd began to swarm onto Christchurch Airport (Harewood). People arrived by private car, public transport and even on foot. Many, fearing they would get caught in a major traffic jam, abandoned their cars once they were within walking distance and went and stood on the grass. At 17:10 ZK-BRD arrived and concluded its 14,640 mile journey from England, which had taken it through ten countries in nine days. Even before the two inboard engines had been shut down, the crowd swarmed round the Viscount for a closer inspection. No such thing as security that day! Viscounts c/n 282 ZK-BRE 'City of Auckland' and c/n 283 ZK-BRF 'City of Christchurch' made the journey out to New Zealand in early 1959 and soon after were introduced to Palmerston North (April) and Wellington (July). A fourth Viscount was ordered in 1959 and this became V.807A c/n 428 ZK-BWO 'City of Dunedin' which arrived in 1961 in time for the opening of the new Dunedin Airport at Momona. Various sources indicate that this was initially allocated the registration ZK-BRG however I have never seen any official supporting evidence. Those letters were given to a Tiger Moth in 1956 and it retained the letters until its demise in August 1968. 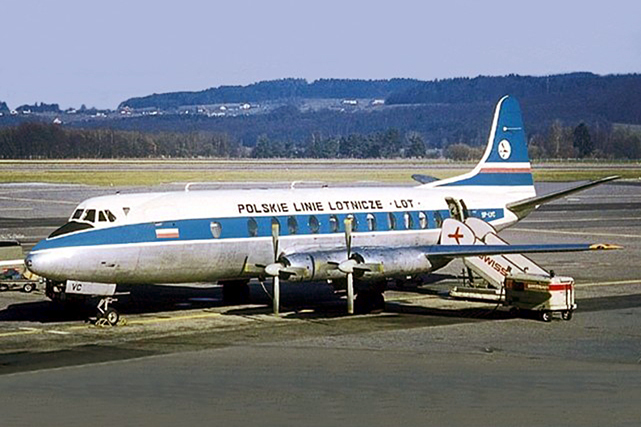 A fifth Viscount, c/n 248 a V.804 (formerly G-AOXU and SP-LVC) was obtained from the Polish Airline LOT - Polskie Linie Lotnicze late in 1966 and entered service as ZK-NAI in June 1967, named 'City of Palmerston North'. NAC had given it an extensive refurbishment and redesignated it as a V.807B. It is interesting to note that this is the aircraft mentioned on the Viscount aircraft histories heading page as having a long and varied careers. It was purchased at a time when NAC was at loggerheads with the New Zealand government over the choice of its first jet aircraft. The government, keen to stay in favour with the British government to protect the New Zealand butter market, wanted BAC 1-11s whereas NAC wanted the unflown Boeing 737, and eventually won. In the meantime, passenger growth was surging and an urgent need arose for another aircraft. And what happened to those aircraft that became ZK-BRA, ZK-BRB and ZK-BRC in place of the Viscounts? Well nothing really. All three remain in an airworthy state as of 2008. Auster ZK-BRA for many years wore the name 'The Bendon Flyer'. 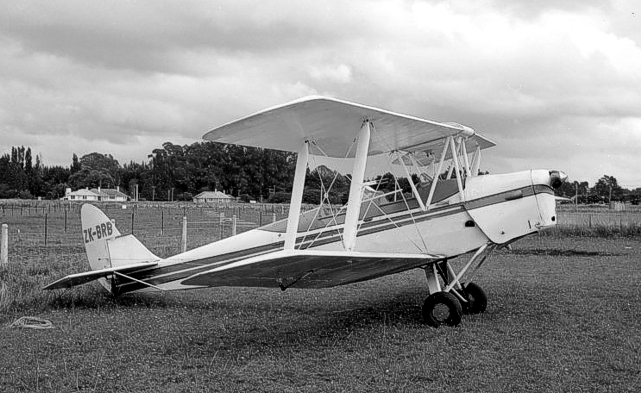 Tiger Moth ZK-BRC was used to train topdressing pilots. In time it became part of the Mount Cook Airlines fleet and I can tell you that Tiger Moth ZK-BRB survived towing me in gliders!